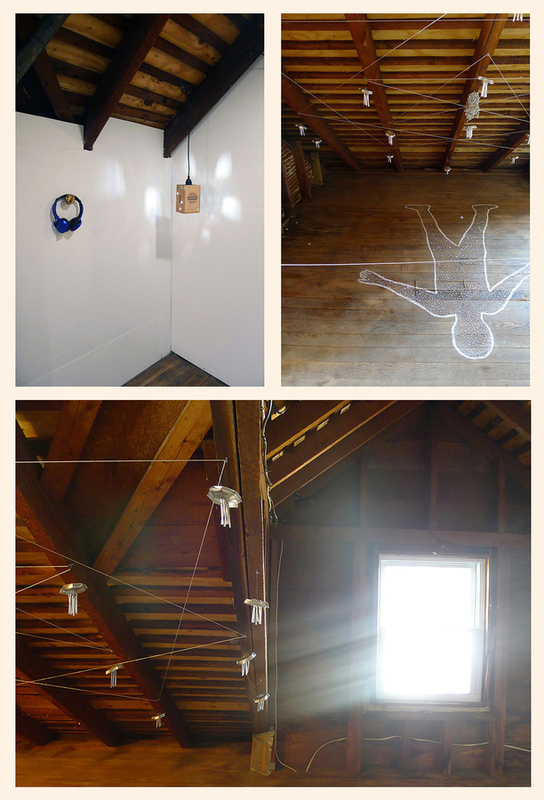 A 27-day artist residency in the attic by the following North Willow alumni artists: Gwen Charles, Asha Ganpat, and Jason M. Stewart. The goal of their residency is to work on site-specific projects that are either a continuation of the dialogue that their previous attic installations created, or to make something entirely new. “The North Willows Attic Residency was the chance to return to where I left off one year ago. The winter of 2017 was devoted to making the work for Remote Viewing, my interactive exhibition of installations and objects exploring the gestures of spiritual ritual and metaphysical self-determination in the context of secrecies and attic spaces. I only had the room and time to execute a handful of ideas, as complete as the exhibition had been, I felt there was much more to express about my relationship to the attic. I was so happy to be invited back! The month-long residency was beset with storms and snowy days. There was so much bundling and trudging. Most of the time I worked in solitude. When Gwen or Jason were there I progressed more slowly. I went in with two goals and hopes for the completion of a dozen more. In the end, I met those two goals and not much else. I completed the components for Soothsayer, a public art installation scheduled for installation shortly after the residency. I was also able to make a sculpture from a cigar box, a donation to a local fundraiser. There were a couple other little actions and thoughts pursued to fill the time during contemplative periods, but they were mere gestures and small exhalations. Usually my work begins with the concept thoroughly intact and imagery developed. This time it was different. I had the whispers of the concept worked out, the basic tendrils, but not the rooted groundwork of the theory. I started with the Soothsayer and pursued the idea back through it’s history. First I found the Sigil of Ameth, popularized in the 16th century claiming origins back before the first millennium, whose magic was promised to be able to transform the practitioner into a soothsayer and endow her with nearly invincible powers. I felt drawn to use a particular simplified version of the Sigil of Ameth, and further research led me to the doorstep of Medieval magic as compiled by the Catholic Church. The Sworn Book Of Honorius is believed to be the collection of those magics, first published in the 14th century but intended to be a most stoically kept secret. By the end of the residency, at the bottom of that rabbit hole, I concluded with an installation of twenty three handmade wind chimes hanging along a Sigil Of Ameth drawn in thread on the attic’s sloped ceiling with a practicioner positioned below, supine on the floor. I titled the installation Charging the Soothsayer. Working within rules and dogmas of the magic, I felt comfortable asserting that the Sigil Of Ameth could empower the chimes through the rituals of drawing, speaking, surrounding, and presenting oneself. If one holds a belief in these ideas, then the spell has been down and the energy passed into the chimes, and the chimes could indeed soothsay. The practitioner form is my own body traced in chalk. It replaces the wide cast ritual circle, often seen in renditions of witchcraft, with a close-fit tracing of the magician who invokes the sigil. The pose was the savasana, the corpse or “dead man’s“ pose. To help the viewer know that magic has been worked, I dotted the space within the outline of the practitioner with iridescence. That addition presented as the residue of magic transforming the whole installation away from frightful superstition. It also alluded to astral projection. The last element, I tied a fine thread to each chime and gathered them in a knot twelve inches above the abdomen of the practitioner. This allowed me to demonstrate the piece and keep it view-only. "I am interested in negotiating the real with the exaggerated, creating conglomerations of second-hand objects that stand as triggers for a past and future potential. These are artifacts of a former existence. They are borrowed from loved ones, purchased at thrift stores, and picked from the trash - carefully mined and selected for their actual or implied significance. These objects come with baggage, a history that I wish to activate while also exposing their absurdity and playfulness. 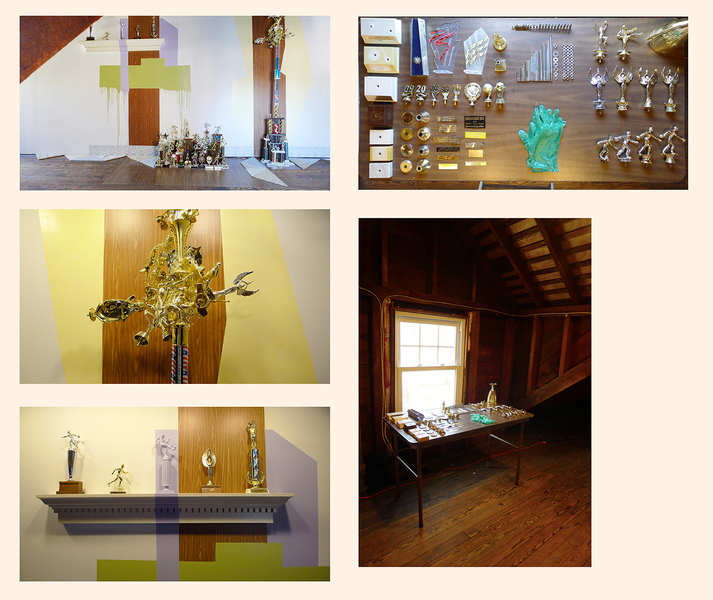 The current work, "Reclaiming Foreign Feats," utilizes trophies, all purchased from thrift stores. The act of buying someone else's accomplishment is something seemingly nonsensical. However, through the dismantling and reassembling of these objects I connect with them and, in turn, the previous possessor. My hands touch their dust and dirt, I read placards of names and achievements, and I hold metallic figures that act as proxies for actual persons. These objects signify a previous sentimental time and place but they are manipulated in ways that adjust our expectations. They are collected and organized with an excessive care that exposes their artifice while honoring their preciousness. "Reclaiming Foreign Feats" tells a story about a story that no longer exists. It deals with something collapsed, a person or world that has been removed. It is through the physical act of making that I honor a past experience and create a new experience - one that attempts to be familar but will always be distant and beyond reality."